In a village, there lived two pretty twin sisters named Anju & Manju. When it was time for them to be married, their marriage was fixed with Karan & Arjun. Manju was the smarter sister of the two and had settled for a love-marriage with Arjun. His clean shaven look had bowled her over! Anju’s marriage was “arranged” with Karan, who had just shifted from the city. Strangely, though Anju & Karan had never met, yet their marriage was fixed as their horoscopes had matched! On the day of the marriage, there was the Haldi^-ceremony in which the Bride & the Groom had to apply Haldi that was sent from one another’s homes. That’s when Anju came to know that Karan had a stubble. Anju wanted Karan to do away with his stubble, else she wouldn’t marry! Their marriage was to be solemnized in the village Temple. When both the grooms, Karan & Arjun reached the Temple, the on-lookers were startled that they looked similar- as if they were twins! The Temple-bells started ringing automatically! 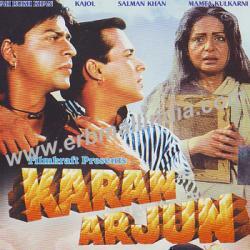 Karan & Arjun were her twin-sons who had got lost in the Kumbh-Mela. The grief had made her lose her memory. Seeing them together, made her regain her memory as they even had the same ‘lockets’! This way there was Maa-Beta (Mother-Son) & Bhai-Bhai (Brother-Brother) Reunion. As both the sons were clean-shaven, it was easy to recognize! Karan & Arjun married Anju & Manju! *83% Women think men with stubble haven’t taken a bath. This is my Twelfth Post for P.A.U.S. I was tagged by Aditya in his Post HERE. Thank you so much, Pallavi :) That's lovely to know! Thanks for your love & support! It's my fuel to keep writing! This is interesting.. had fun reading.... A question...Do I need to tag more people with my blog post? By the way, so many entries for the contest :0 Unbelievable !!! Good one Anita... You seem to be quite a warrior against the stubble!! Thanks Sreesha :) Glad you liked it! you have been the champion of PAUS. congrats on those prizes. Thanks a lot, Amar :) Happy that you liked my PAUS entries.